GRAFENWOEHR, Germany — Leftovers, beer bottles and broken appliances: in the trash they go. Tossing everything in one waste bin may be acceptable in the United States, but at USAG Bavaria, it’s illegal. DOD personnel stationed in Germany must sort trash and recycle. Host nation and Installation Management Command Europe regulations require all DOD community members and training units to separate household and special waste products from non-recyclable refuse. These items must also be discarded correctly — thrown in the right bag and taken to the proper recycling center or drop-off point. Failure to sort trash or illegally dumping waste at incorrect recycling centers can result in German fines ranging from €30-250 and administrative UCMJ actions. The Soldiers’ chains of command will also be notified. To report illegal dumping and trash violations, call the Military Police Front Desk at DSN 476-3398/3397, CIV 09662-83-3398/3397. The German recycling system may seem complicated at first, but it’s crucial to Germany’s environmental sustainability efforts and better for the planet. Plus, it’s easy once it becomes an everyday routine. Here’s a quick guide on how to sort and recycle at USAG Bavaria. Rule #1: Regular waste and recyclables — leftovers, paper, milk cartons, cans and glass jars — must remain in your community’s waste system, according to German law. In other words, don’t take your recyclable products or extra trash bags to another community for disposal. It’s also against IMCOM Europe policy to take excess waste on-post. Rule #2: Separate everyday waste into five groups: refuse, paper, plastic or packaging, metal and glass. Some communities also require separate recycling of plant-based biodegradable waste, or “bio waste.” It depends on the community, but typically refuse, paper, plastic and bio waste are collected on a bimonthly or monthly basis. Metal and glass products, however, must be taken to a community’s recycling center. Check your community’s Waste Pick-Up Schedule and Recycling Separation Guide for specifics. What is it? Kitchen and food waste, such as fruit and vegetable remains, leftovers, coffee filters and other organic and compostable waste; used paper products; diapers; torn clothing; ceramics and china; pet litter and non-recyclable materials. What is it? Cardboard, envelopes, magazines, paper egg cartons and wrapping paper. What is it? Plastic bags and bottles, styrofoam, milk cartons, Tetra Paks and aluminum. What is it? Food cans, soda cans, empty non-hazardous spray cans and small metal items. What is it? Only bottles and jars, separated by color: clear, brown or green. What is it? Plant-based biodegradable or compostable materials, such as fruit peels, coffee grinds, egg shells and leftover vegetables. What about the stained sofa, broken shelf and empty multi-surface cleaning spray? In Germany, bulky, hazardous, electrical and automotive waste have special disposal and recycling procedures. IMCOM Europe policy authorizes both on- and off-post DOD personnel to discard these items on the installation. Off-post residents may also take special waste to local recycling yards, or “Wertstoffhof.” Specific community locations at www.Bavaria.army.mil/trash. Furniture, mattresses, carpets, bicycles, strollers and other items too large for regular refuse bin. Cleaning products, acids and bases, bleach, solvents, paints, aerosols, fluorescent or energy-efficient light bulbs, nail polish, printer cartridges and any substances with hazard symbols. Appliances, entertainment equipment, TV, phones, cooling devices and radios. Motor oil, parts contaminated by oil, car batteries, antifreeze, tires and engine parts. 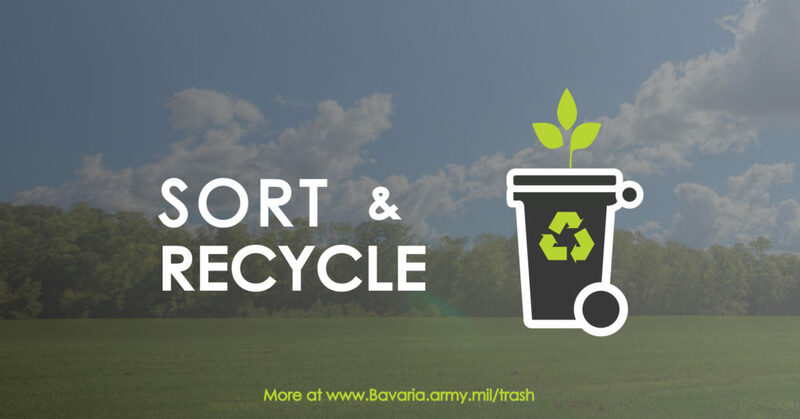 In an effort to reduce pollution and achieve the goal of net-zero waste by 2020, USAG Bavaria also encourages the donation of clothing and compost materials. Cut grass, leaves, bush trimmings, branches, twigs, plants and plant soil. Clean, reusable clothing, shoes or textiles. For any questions regarding recycling and trash, contact the Separate or Recycle Trash, or SORT, Coordinator, located at Tower Barracks, Bldg. 329; Rose Barracks, Bldg. 140; and Hohenfels, Bldg. 125.